In January, Davidoff invited a small group of retailers, sales staff and business partners for a week of exploration and deep discovery of the company’s cigars, philosophy and values. Here’s an inside look at what they experienced. Every legend and superhero has an origin story. In the premium cigar industry, Davidoff is viewed as the creme de la creme of premium cigars—luxury, high-quality and, at times, ultra-premium. 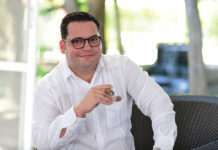 Davidoff understands how it is perceived by the outside world, which is why the company has set out to reveal its own origin story to the world in the most unique way possible. Viaje Al Origen (which translates in English to “journey to the origin”) is Davidoff’s take on what the tobacco industry would call a factory tour. In true Davidoff fashion, the company behind some of the industry’s most highly regarded and sought-after premium cigars designed a factory tour unlike any other. For six days in January, Davidoff invited some of its top appointed merchants and sales staff to the Dominican Republic to see firsthand how the company creates its cigars. Viaje Al Origen was designed to take the visitor on a journey into Davidoff—the fields where the tobacco is grown, the barns where leaves are fermented and cured, and the factory where the precious leaves are rolled into premium cigars. As with most origin stories, Davidoff’s journey to success was filled with many twists and surprising discoveries. The retailers included in the trip were some of Davidoff’s top merchants from around the U.S., Mexico and Canada. Many had taken part in factory tours led by other manufacturers in the past, but few had experienced one as hands-on as Viaje Al Origen. Tapping into the latest trend of experiential marketing, trip organizers Klaas Kelner, Sara Tio and Lisbeth Genao understood the importance of stimulating all of the senses in order to help the company’s retail partners and sales staff truly understand what makes Davidoff unique. Davidoff employees stem tobacco as Klaas Kelner describes Davidoff’s commitment to quality at the facility located at Jicome in the Dominican Republic. greenhouse and in the factory, there were things to be touched, inhaled and watched. Throughout the trip, it was clear how Davidoff has earned its lofty title as being among the leading premium cigar manufacturers after 50 years of business. It’s the dedication and commitment shown by the nearly 300 hands that touch the tobacco before it reaches a humidor shelf. It’s the company’s quest for perfection that shapes its production process, including the many quality-control checks that each cigar undergoes and the meticulous sorting process each cigar is subjected to. It’s the knowledge and passion exhibited and passed on by Klaas Kelner, his father, Hendrik “Henke” Kelner, Hamlet Espinal and master blender Eladio Diaz. None of this could have truly been communicated via an in-store visit or training seminar. Shore Thing Cigars’ Paul Copeland poses for a photograph in the middle of Davidoff’s white label factory in Villa Gonzalez. Eugenia Mouissant of Bo’s Cigar Lounge holds freshly harvested tobacco leaves. 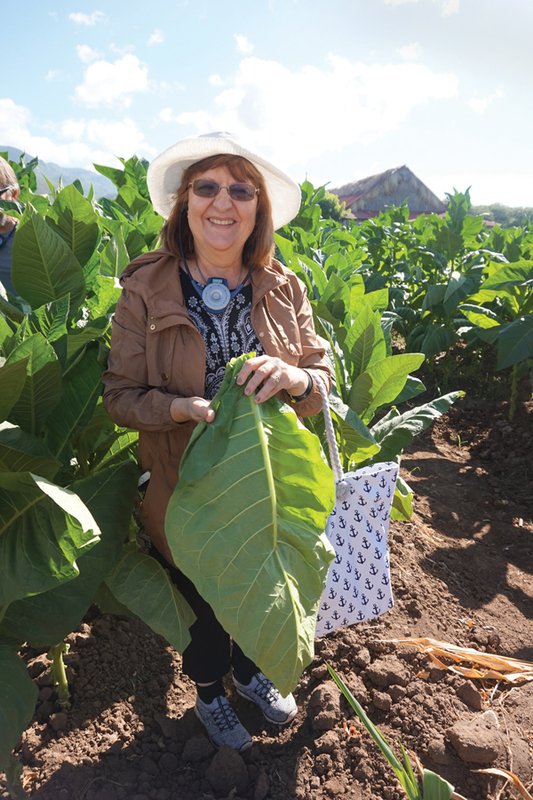 Participants of Viaje Al Origen were encouraged to touch and experience tobacco throughout the week. 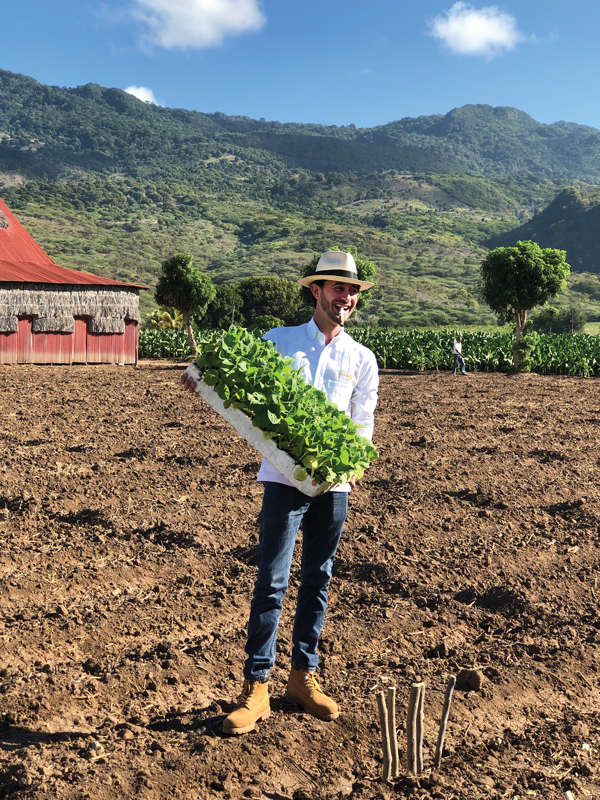 These were just some of the takeaways from this trip that was meant to bring some of Davidoff’s closest retail and business partners on a journey through its Dominican operations. Klaas Kelner said it was his hope that those attending the tour would take back with them an experience that would enable them to better communicate Davidoff’s principles and values to consumers. 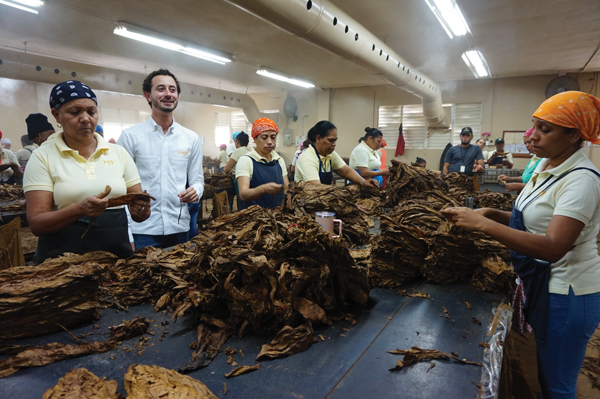 What could also be seen throughout the trip was the commitment and dedication that many of the retailers have for Davidoff and the tobacco industry as a whole. Throughout the week, these retailers—many of them having met for the first time during the trip—could be seen and heard trading stories about their respective stores, their approaches to business and the struggles they face in today’s industry. Bonds and friendships were made during the tour that will no doubt continue to grow and develop well beyond the tobacco fields and tropical shores of the Dominican Republic. Passion. Quality. Knowledge. Commitment. Those were some of the words used to describe Viaje Al Origen on the final day of the trip. Over the course of the week, those attending left understanding a great deal more about the various Davidoff cigar lines but also about what sets Davidoff apart from its competitors. There’s the factory, which Davidoff has flipped on its head by changing the industry status of how many employees are dedicated to rolling the product compared to how many are focused on process and quality control. There’s its standard for what makes a good cigar and how many cigars never make it out of the factory due to something most would consider inconsequential. There’s its commitment not only to making good cigars but to also making sure the company’s employees are happy and passionate about the premium cigars they are making for the world. Klaas Kelner proudly presents seedlings ready to be planted in Davidoff’s tobacco fields located in Jicome. “It is a seductive brand, but it takes people who are committed to make all of this happen,” said Dylan Austin, president of at Davidoff Americas. The next time you light up a Davidoff cigar, remember that more than 300 hands have touched the tobacco wrapped in that cigar before it even reached your store. Davidoff’s reputation of being a luxury brand is earned—not given—through the 100-plus steps of labor it takes to create one cigar. Lastly, from the crop to the shop, it’s the people at Davidoff who fill each cigar with the passion, dedication and love for the leaf that make each Davidoff cigar the choice for so many to fill their time with beautifully. 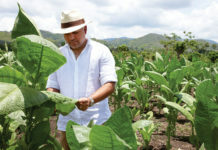 This story first appeared in the March/April 2019 issue of Tobacco Business magazine. 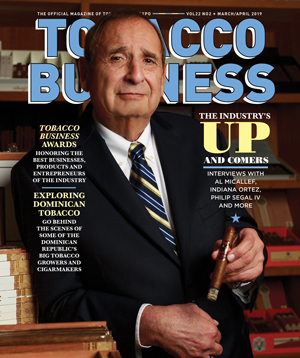 Members of the tobacco industry are eligible for a complimentary subscription to our magazine. Click here for details. 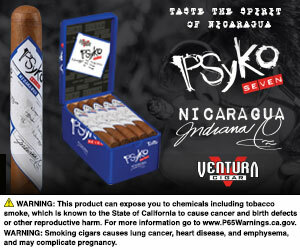 – Story and photos by Antoine Reid, an editor and digital content director for Tobacco Business Magazine. You can follow him on Instagram @editor.reid.